Is this V groove or 1/8" spacing between your white panels? Thank you! V Groove. It is pine flooring. Re: The rustic style walls...What grade of lumber did you use? - If lower grade was it installed then sanded down for smoothness? We used pine flooring. It was smooth. It required sanding after it was primed, before the first coat of paint. Details please - I adore this simple way of displaying photos!! I am so not handy or crafty so would you mind sharing how you hung it up? Thanks a million! LOVE! LOVE! LOVE! the pictures!!!! How was this hung? A clothesline showcases family pictures in black and white, another symbol of the family-centric values that Ranee and her community extol. 17. 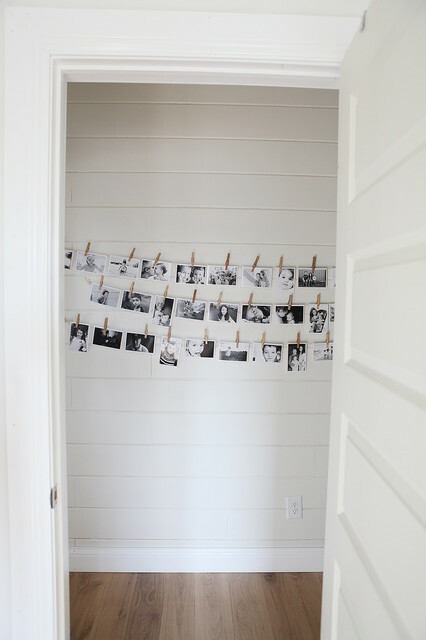 String up photos like a clothesline for an easy, rotating display. Have a big blank wall in the hallway just begging for an artistic display? Try rigging up a few rows of twine or fishing filament between small nails, then use clothespins (mini or regular size) to clip up a selection of photos from your summer. For a cohesive look, try choosing photos based on a color theme: all black and white, for instance, or blue sky and sea pictures. Pegs at different heights for hallway? ?